[SatNews] Keysight Technologies, Inc. has announced that its FieldFox handheld combination analyzers provide a precise and comprehensive solution for satellite ground station maintenance in the aerospace/defense and commercial markets. FieldFox quickly assures system performance with a high level of confidence to help speed satellite ground station installation and maintenance. As satellite ground stations have long-range communication links, they must provide high uplink transmit power, receive a very low signal level on the downlink, and compensate for link variation due to weather and satellite/ground antenna changes. The ground stations contain many sensitive components and subsystems (e.g., antenna subsystems, waveguides, coaxial cables, filters, LNAs, LNBs, BUCs, HPAs and TWTAs) that must be verified during installation and maintenance. The spectrum performance of the whole system must also be monitored. Such tasks become all the more challenging when the ground stations are located in remote areas. The FieldFox handheld analyzers offer the precision, frequency coverage (up to 26.5 GHz), and all-in-one capability (e.g., spectrum analyzer, full 2-port vector network analyzer and power meter) needed to perform a range of benchtop-quality measurements in difficult test environments. Now, with the introduction of measurement Option 208, FieldFox is the perfect tool for satellite communication field test. FieldFox Opt. 208 verifies frequency converters installed in satellite ground stations and performs most required maintenance tasks. Users can even use FieldFox to perform cable and antenna test, vector network analysis like S-parameters, power measurements, spectrum analysis, and interference detection—all of which are critical for efficient ground station maintenance and troubleshooting. Because all of this is performed using just a single instrument, users no longer need to carry multiple bench top boxes into the field. FieldFox Option 212, also recently announced, expands cable testing beyond just single-ended coax cable to provide insight into differential device performance. Option 212 allows FieldFox to measure the reflection performance of 1-port differential devices such as twisted cable pairs or printed circuit boards. Additionally, it enables FieldFox to make time-domain measurements of differential devices under mixed-mode operation. New Data Link software for the FieldFox family of analyzers is also being introduced today. The software integrates remote viewing, control and SCPI command consoles as well as enables users to more easily control and monitor remote instruments and automate test processes. Satellite operators, for example, can now monitor the spectrum performance of satellite communication links from a control center. 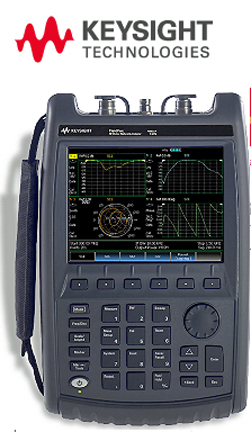 The Keysight Technologies infosite has more information at this link.